“Most agents consider ‘full service’ to mean brochures and open houses once a home is on the market,” says Conrad Steller, founder of The Steller Group. But for Steller, 90 percent of the work happens before the sign goes in the yard. 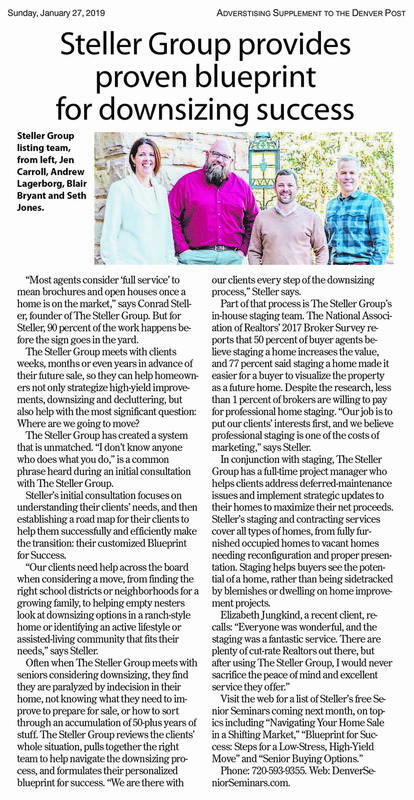 The Steller Group meets with clients weeks, months or even years in advance of their future sale, so they can help homeowners not only strategize high-yield improvements, downsizing and decluttering, but also help with the most significant question: Where are we going to move? The Steller Group has created a system that is unmatched. “I don’t know anyone who does what you do,” is a common phrase heard during an initial consultation with The Steller Group. Steller’s initial consultation focuses on understanding their clients’ needs, and then establishing a road map for their clients to help them successfully and efficiently make the transition: their customized Blueprint for Success. “Our clients need help across the board when considering a move, from finding the right school districts or neighborhoods for a growing family, to helping empty nesters look at downsizing options in a ranch-style home or identifying an active lifestyle or assisted-living community that fits their needs,” says Steller. Often when The Steller Group meets with seniors considering downsizing, they find they are paralyzed by indecision in their home, not knowing what they need to improve to prepare for sale, or how to sort through an accumulation of 50-plus years of stuff. 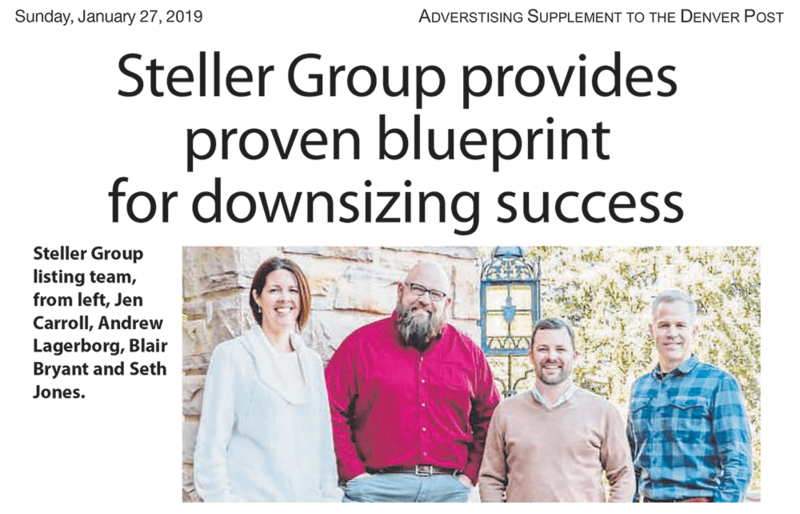 The Steller Group reviews the clients’ whole situation, pulls together the right team to help navigate the downsizing process, and formulates their personalized blueprint for success. “We are there with our clients every step of the downsizing process,” Steller says. Part of that process is The Steller Group’s in-house staging team. The National Association of Realtors’ 2017 Broker Survey reports that 50 percent of buyer agents believe staging a home increases the value, and 77 percent said staging a home made it easier for a buyer to visualize the property as a future home. Despite the research, less than 1 percent of brokers are willing to pay for professional home staging. “Our job is to put our clients’ interests first, and we believe professional staging is one of the costs of marketing,” says Steller. In conjunction with staging, The Steller Group has a full-time project manager who helps clients address deferred-maintenance issues and implement strategic updates to their homes to maximize their net proceeds. Steller’s staging and contracting services cover all types of homes, from fully furnished occupied homes to vacant homes needing reconfiguration and proper presentation. Staging helps buyers see the potential of a home, rather than being sidetracked by blemishes or dwelling on home improvement projects. Visit the web for a list of Steller’s free Senior Seminars coming next month, on topics including “Navigating Your Home Sale in a Shifting Market,” “Blueprint for Success: Steps for a Low-Stress, High-Yield Move” and “Senior Buying Options.”Phone: 720-593-9355. Web: DenverSeniorSeminars.com.